Visit www.fibreworksgallery.com for updates and workshop details. The last rays of the summer sun are being enjoyed by visitors to “Primitive Elegance” ­ a tribal weaving exhibition by Marilyn Foubert – the exhibition continues through to Saturday, September 29th. Saturday, October 5th, we are opening Elin Noble’s exhibiton – “Vox Stellarum” – silk itajime panels. Opening Reception – 2:00 to 4:00 p.m. – all are welcome! Unfortunately, due to ill health, Elin will be unable to join us at the opening reception – so we will need to send her our best wishes and lots of pictures of the opening to provide her with the energy for a speedy recovery. 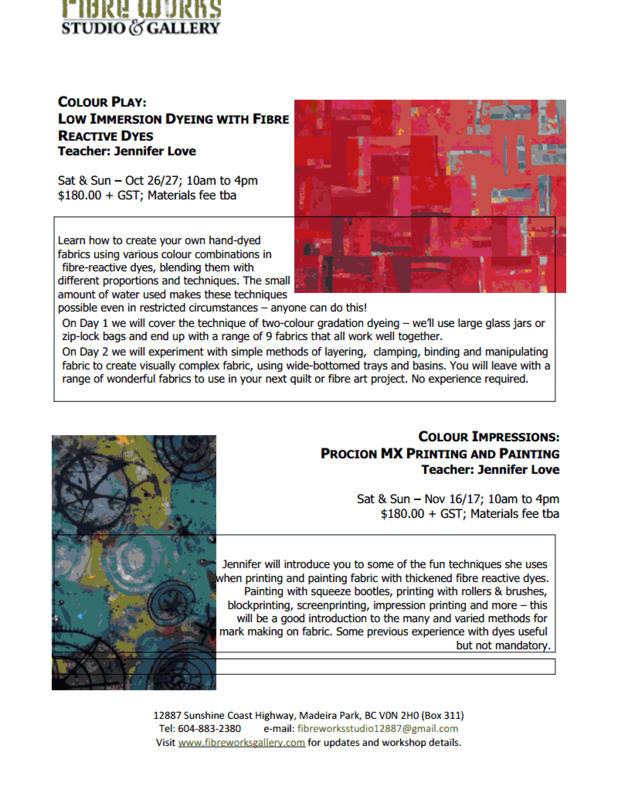 With regret, we report the cancellation of the workshops, “Folds” and “Alternative Marbling” with Elin Noble. As noted above in the Exhibition section, due to ill health, Elin is unable to travel and teach at this time. We will stay in contact and reschedule when Elin is able to return to the Sunshine Coast. United In Stitch features the work of Vickie Newington and Pam Godderis Dangerfield. Pam's work incorporates stitching on layered manipulated computer images while Vickie stitches and felts fibre and incorporates her fused glass. Each explore northern landscapes: Pam's work includes some images from her cruise to Antarctica, and Vickie's includes images from the Yukon. Celebrate Alberta Culture Days with the AFA Art Collection! This exhibition features fibre artworks from the AFA collection showcasing the diversity of media and techniques that Alberta artists have used over the past 50 years. The exhibition works reflect the development of Alberta fibre art and the evolving lives of Albertans. Join us and explore the AFA's role in sharing and preserving this legacy. Located at 10708-105 Avenue, Edmonton, AB. Boundaries, borders and edges... To what extent is a country defined by its perimeter...by the choices and placement of edges? Whether political, historical, psychological and/or geographical, our comprehension and expression of these points of delineation represent integral parts of who we are, both as individuals and collectively. Be it selvedge to selvedge, raw edge or treated, our textiles have unavoidable beginnings and endings. How these are handled can be as varied as the makers themselves. The SDA welcomes your rich interpretation of this concept in presenting a diverse Canadian perspective on our boundaries. Opportunities are being explored to mount this exhibition in a number of venues - at the SDA Conference in Tulsa, Oklahoma, June 2015, at the Newfoundland & Labrador Fibre Arts Conference in Gros Morne National Park, October 2015, and elsewhere. A Call for Entry will be sent out by email in 2014 when a venue has been confirmed. All Canadian members of the Surface Design Association are invited to participate. Artists must be current members of the Surface Design Association as of January 2015, and resident in Canada. All work is to be created within the boundaries of a two-dimensional 16x28 inch rectangle format, to be hung vertically. Specific hanging guidelines are available. The work should best represent your current practice, be it experimental or signature style, and speak to the theme expressed above. This call is open to all artists working with hand woven tapestry. ATA invites entries not only from artists who work within more traditional definitions of tapestry, but also those artists who work expands upon the core principles of the medium as it explores new techniques and processes. 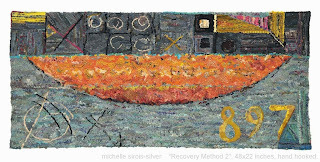 Multi-media work is welcome as long as the primary technique is tapestry. The size of the tapestry may not exceed 10" by 10" by 1" deep. Artists may submit only one piece. Group challenges and mentoring pairs are encouraged. Work must be original, executed by the entrant, of recent completion and not shown in a prior ATA show. UNTITLED will hang at URI Feinstein Providence Campus Gallery, July 1 - August 23, 2014. Celebrating Craft in Newfoundland and Labrador and Craft Year 2015, Fibre Arts Newfoundland and Labrador will take place from October 15 - 18, 2015 in beautiful Gros Morne National Park. The Instructor Committee is now calling for proposals from interested designers, makers, and teachers. We invite you to be creative, and develop sessions that will inspire our Conference participants to reach beyond the boundaries of their current studio practices, and think in new ways, explore new ideas and develop new products. The Committee welcomes innovation in techniques and materials. 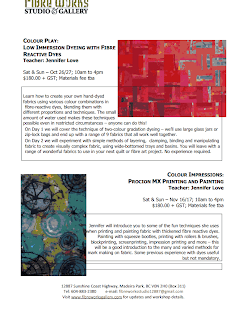 Please follow this link for more information or contact events@craftcouncil.nl.ca for answers. Call the shop at (403) 217-4871 to register. 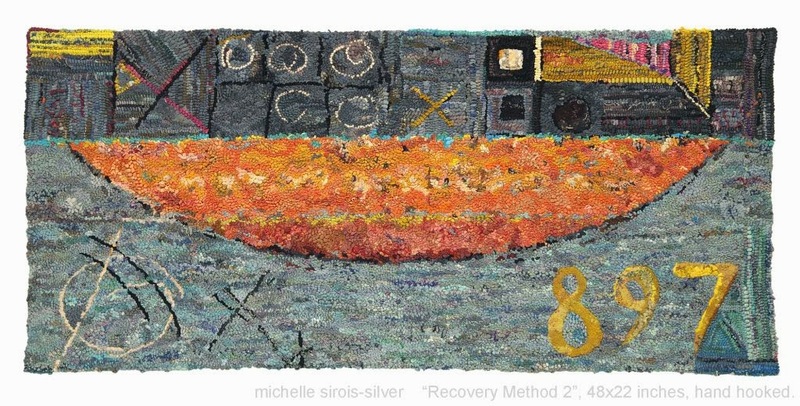 Congratulations to Michelle Sirois-Silver, whose new work Recovery Method 2, has been juried into the 2015 Fiber International at Sebastopol Center for the Arts in Sebastopol, CA. Innovations in Fiber Art VI is a juried exhibition presenting thought-provoking, unconventional and innovative fiber works in a range of materials--metals, mesh, paper, wood, natural or manmade fibers--applied to fiber techniques, Accepting two- or three-dimensional pieces including wearable art and installations. See attached image of Michelle's work, and following is some information she sent about it.